These pliers that have a semi-circle curve perfect for wire wrapping. 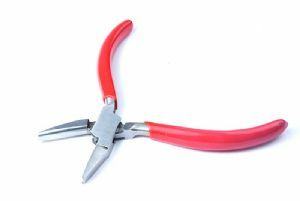 A perfect tool for jewellery making. Made of stainless .steel with one semi-circle smooth jaw and other half round smooth jaw, also fixed with special non-slip PVC handle for a perfect grip. Overall length approximately 130 mm.